The Catholic Church is a part of the New World Order, as are nearly all mainstream religions. Christianity has never been found in any religion; but rather, in the Word of God in the Person of Jesus Christ. 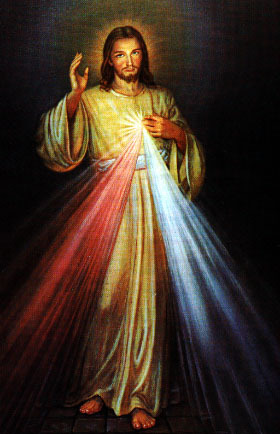 The Image of Divine Mercy (pictured below to the right) plainly displays the New World Order pyramid, signifying loyalty to the Luciferian order . . .
Notice that the Illuminati pyramid on the back of the U.S. dollar (center) is the same as The Image Of Divine Mercy (right) worshipped by Catholics. On the left is Homeland Security's original logo. The Pyramid is a symbol of the occult, the Luciferian order. Notice that Jesus' belt separates the capstone from the base of the pyramid. The eye seen is human and represents secret societies who worship Lucifer, hate the God of the Bible and have their secret agenda for the future of mankind. It's hard to imagine but it's true—hundreds-of-millions of Catholics go to mass every Saturday and worship Lucifer in plain view of The Image Of Divine Mercy displayed at the front of their worship building. They're worshipping the Beast indirectly and think they're worshipping God. The Blessed Virgin they worship is in fact the Queen of Heaven, which the ancient Babylonians worshipped. To worship in a Luciferian religion is to worship Satan. Catholicism is a false religion, clearly evidenced by the following statement describing The Image of Divine Mercy . . . SOURCE: Diary, Saint Maria Faustina Kowalska, Divine Mercy in My Soul (c) 1987 Congregation of Marians of the Immaculate Conception, Stockbridge, MA 01263. All rights reserved. Used with permission. The Bible teaches that Salvation is wholly and solely by faith in Jesus Christ. Ephesians 2:8,9, "For by grace are ye saved through faith; and that not of yourselves: it is the gift of God: Not of works, lest any man should boast." In these Last Days, Satan has woefully deceived the masses of society. Even many Independent Fundamental Baptist churches have joined the New World Order. Wake up America! Everywhere we turn these days we see the all-seeing Eye of Horus and the pyramid. Please read, RELIGIONS: THE OCCULT CONNECTION. What does this all mean? It means that the coming of the Antichrist and the Lord's return are imminent. The Mystery of Iniquity is near completion. 2nd Thessalonians 2:7, "For the mystery of iniquity doth already work: only he who now letteth will let, until he be taken out of the way." The New World Order is the “mystery of iniquity” in my humble opinion. It's been in the works since the tower of Babel in Genesis chapter eleven, when men united together in rebellion against God. We are living in frightening and exciting times. We are witnessing the formation of a global governing body, a one-world religion, a global cashless society, a global military control grid and a one-world economy. Everywhere we turn we are seeing people flashing the Satanic El Diablo hand sign, which shows allegiance to the Beast (Satan). The Bible foretells of the Antichrist (a political leader), the False Prophet (likely the Pope) and the Beast (Satan). The Bible doesn't say that the Mark of the Beast will be 666; but rather, the name of the Antichrist. The sicko world is ready to welcome the sicko Antichrist. SOURCE: Manly P. Hall, The Secret Destiny of America, pp. 174, 181. “Many modern groups, though not related...claim to be offshoots of the original so-called Mystery Religion. They all carry the same symbols, such as the All-Seeing Eye, and believe in the same so-called Secret Doctrine.